What is Hunters Helping Lenawee? 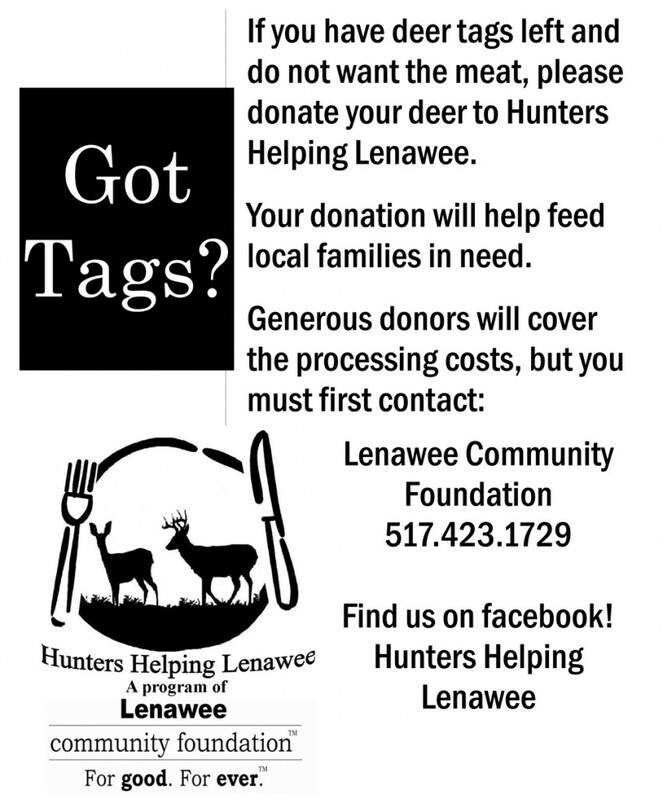 A program of the Lenawee Community Foundation to provide venison from local hunters to local food pantries. Why was the program initiated? According to the USDA, one in every seven households is “food insecure” – not sure where they’ll get their next meal. In Lenawee County, over 9,000 children meet income qualifications for free or reduced lunches. Each month, 50 or more new families seek assistance from our local food pantries. Over 1,000 individuals are served by our local food pantries monthly, and about half are children, many who experience significant protein deficiencies. One deer can provide meat for one meal for more than 200 people! Additional benefits from the program include better deer management, reduced crop damage, and fewer deer-vehicle crashes. Hunters bring their fresh, clean, field-dressed, tagged, legally harvested deer to a participating meat processor. They tell the processor that the deer is to be donated to the Hunters Helping Lenawee program. How do I find a participating processor? Who pays for the cost of the processing? Can I get a tax deduction for my $20 donation? What happens to the donated deer after it’s delivered to the processor? Can I designate who will receive the venison? Who can I contact if I have questions about the Hunters Helping Lenawee program? Only USDA or MDA certified processors are allowed to participate in the Hunters Helping Lenawee program. At the present time, participating processors are Kaspers Hickory House in Clinton and Exact Wildlife Creations in Tipton. Hunters are encouraged to make a $20 donation towards the cost of the processing, since it will enable the program to maximize the food that can be provided for those who need it the most. Checks should be made payable to Lenawee Community Foundation, and given to the processor. The balance of the processing cost will be paid by the Lenawee Community Foundation from a special fund that has been established for this purpose. The Lenawee Community Foundation will issue a receipt for tax purposes for all cash donations, as well as donations of deer. The hunter is expected to determine the dollar value of donated venison, just as one would compute donations of used clothing or household goods to charity. One deer typically provides 60 pounds of meat and over 200 meals. The processor handles processing, packaging, and freezing the venison, and then Lenawee County food pantries pick up the venison, and subsequently distribute it to individuals and families in need. Not through this program. The venison will be given only to Lenawee food pantries, and they will distribute it to local individuals in need. The #1 reason reason for hunger is poverty. This can be caused by a cost of living that outpaces wages, unemployment or under-employment, high health costs, barriers to education, or inadequate life skills. Poverty leads to chronic malnutrition. Childhood hunger is especially critical because it puts children at developmental risk. Childhood hunger impedes growth; causes delays in speech, reading and mathematical skills; and negatively impacts behavior and movement – effects that extend into later development. It results in more illness/inability to fend off illness; poorer mental health; more aggressive behavior, hyperactivity, & anxiety; and impedes the ability to learn. Hunger is associated with school absenteeism, tardiness, and grade repetition. In the past decade, there has been a 15% increase in Lenawee children at nutritional risk. Currently 37% — over 7,000 children or approximately 11 children in every classroom – qualify, based on family income, for free or reduced lunch at school. For some children, this is their only meal for the day. It is estimated that an additional 2,000 local preschool children would meet income qualifications for free lunches if they were of school age. Good nutrition and protein in children’s diets are essential elements to overall development. If all of the 36 million Americans faced with food insecurity stood in line at a food pantry in New York City, the line would stretch to Los Angeles and back. Two persons working full time at minimum wage take home approximately $1,500 per month. Their average housing and utilities typically equal or exceed half of their income. Could you feed, clothe, pay dental & medical bills, cover vehicle costs (including gas and insurance), and pay child care on less than $200 a week? At the present time, over 16,000 Lenawee residents – 1 in every 6 persons — receive food assistance through the Department of Human Services. The number of persons receiving this assistance has grown by more than 10,000 over the last five years, primarily due to unemployment and under-employment. A 2009 survey documented: 44% of households had to choose between paying their utility/heating bill or food; 34% had to choose between paying their rent/mortgage bill or food; and 28% had to choose between paying medical bills or food. While our food pantries are usually successful in getting donated or low-cost canned goods and nonperishable food, a critical need of our local food pantries is protein. Thank you for helping to alleviate hunger in Lenawee!